After the Prius WiFi Sunflowers, Prius blog tie-ins and Prius Facebook activity, Toyota have now created a (US based?) 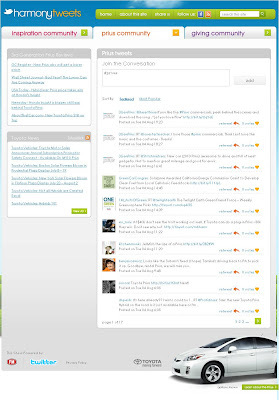 Prius Twitter aggregation site called Harmony Tweets. 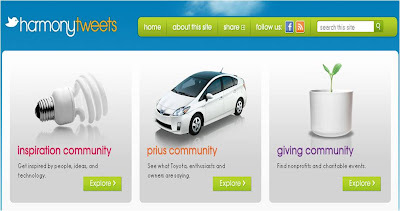 Harmony Tweets has three main tweet aggregation areas / 'communities' - Inspiration, Prius and Giving. Each area mines Twitter for tweets with relevant hashtags, before aggregating them and allowing the community to vote on them. The site also pulls in relevant articles from HowStuffWorks.com, 3rd Generation Prius reviews and Toyota News. The Harmony Tweets site says: "Whether your passion is design, social good, or clean technology, HarmonyTweets plugs you in to innovation and inspiration updates from charitable organizations, industry leaders like Toyota, and sustainability-minded individuals. You can add a bit of positivity to your day by exploring and contributing to the inspiration, giving and Prius communities." Harmony Tweets may need more promotion to get scale, but it's another nice way of being useful / interesting, Listening and creating engagement with the audience - all while amplifying Prius brand association with desired 'editorial.' Harmony Tweets is also a good example of 'letting go' and trusting that the product is strong enough to warrant positive commentary across the board. I now want a new Prius even more!